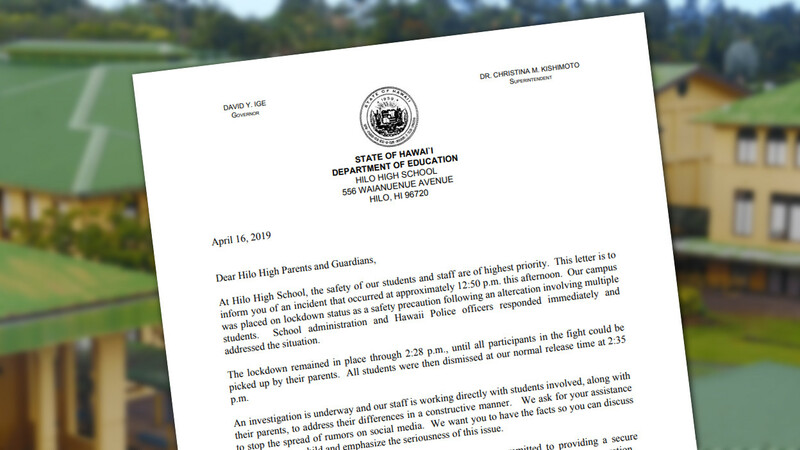 HILO, Hawaiʻi - Reports of a fight and subsequent lockdown that occurred at Hilo High School on Tuesday were confirmed by the principal in a letter home to parents. (BIVN) – Reports of a large fight and lockdown that occurred at Hilo High School on Tuesday were confirmed by Principal Robert Dircks in a letter sent home to parents. Dircks said the lockdown remained in place through 2:28 p.m., “until all participants in the fight could be picked up by their parents.” All students were then dismissed at the school’s normal release time of 2:35 p.m., he said. An investigation is underway and our staff is working directly with students involved, along with their parents, to address their differences in a constructive manner. We ask for your assistance to stop the spread of rumors on social media. We want you to have the facts so you can discuss them with your child and emphasize the seriousness of this issue. The safety of our students is a major priority and we are committed to providing a secure campus. I would like to commend our students, parents, teachers and staff for their cooperation.